Find your perfect Wing Back Chair on UK's Largest Sofa website. 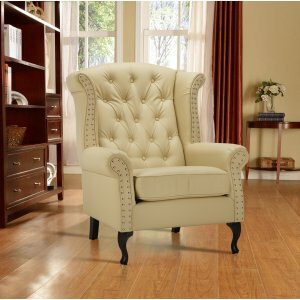 Wide range of Wing Back Chairs with interest-free credit & fast delivery available. • Elegant scroll arms work well in classic or contemporary settings. • Made in bonded leather and leather match providing with high comfort and durability • Foam filled backs with deep chesterfield buttons. • Comfortable foam seating. • This extremely luxurious contemporary double seat chair combines style, quality and value at an affordable price. • Hardwood frame • Elegant wooden feet. • Fully compliant with UK fire regulations. 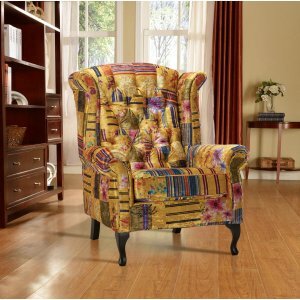 Gold mustard velvet wingback chair • Elegant scroll arms work well in classic or contemporary settings. • Crafted in luxury French velvet style durable polyester fabric to create a wing back chair of exceptional beauty. • Foam filled backs with deep chesterfield buttons. • Comfortable foam seating. • This extremely luxurious contemporary chair combines style, quality and value at an affordable price. • Hardwood frame • Elegant wooden feet. • Fully compliant with UK fire regulations. Blue velvet wingback chair • Elegant scroll arms work well in classic or contemporary settings. 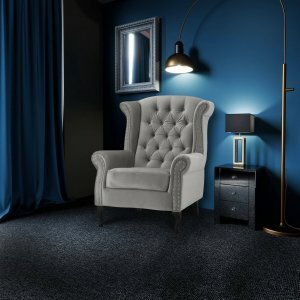 • Crafted in luxury French velvet style durable polyester fabric to create a wing back chair of exceptional beauty. • Foam filled backs with deep chesterfield buttons. • Comfortable foam seating. • This extremely luxurious contemporary chair combines style, quality and value at an affordable price. • Hardwood frame • Elegant wooden feet. • Fully compliant with UK fire regulations. 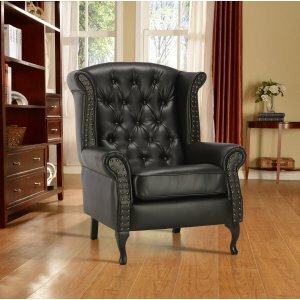 Black wingback chair leather • Elegant scroll arms work well in classic or contemporary settings. • Made in bonded leather and leather match providing with high comfort and durability • Foam filled backs with deep chesterfield buttons. • Comfortable foam seating. • This extremely luxurious contemporary chair combines style, quality and value at an affordable price. • Hardwood frame • Elegant wooden feet. • Fully compliant with UK fire regulations. Brown wingback chair leather • Elegant scroll arms work well in classic or contemporary settings. • Made in bonded leather and leather match providing with high comfort and durability • Foam filled backs with deep chesterfield buttons. • Comfortable foam seating. • This extremely luxurious contemporary chair combines style, quality and value at an affordable price. • Hardwood frame • Elegant wooden feet. • Fully compliant with UK fire regulations. Burgundy wingback chair leather • Elegant scroll arms work well in classic or contemporary settings. • Made in bonded leather and leather match providing with high comfort and durability • Foam filled backs with deep chesterfield buttons. • Comfortable foam seating. • This extremely luxurious contemporary chair combines style, quality and value at an affordable price. • Hardwood frame • Elegant wooden feet. • Fully compliant with UK fire regulations. Cream wingback leather chair • Elegant scroll arms work well in classic or contemporary settings. • Made in bonded leather and leather match providing with high comfort and durability • Foam filled backs with deep chesterfield buttons. • Comfortable foam seating. • This extremely luxurious contemporary chair combines style, quality and value at an affordable price. • Hardwood frame • Elegant wooden feet. • Fully compliant with UK fire regulations. Purple wingback chair • Elegant scroll arms work well in classic or contemporary settings. • Crafted in luxury French velvet style durable polyester to create a wing back chair of exceptional beauty. • Foam filled backs with deep chesterfield buttons. • Comfortable foam seating. • This extremely luxurious contemporary chair combines style, quality and value at an affordable price. • Hardwood frame • Elegant wooden feet. • Fully compliant with UK fire regulations. Teal turquoise wingback chair • Elegant scroll arms work well in classic or contemporary settings. • Crafted in luxury French velvet style durable polyester fabric to create a wing back chair of exceptional beauty. • Foam filled backs with deep chesterfield buttons. • Comfortable foam seating. • This extremely luxurious contemporary chair combines style, quality and value at an affordable price. • Hardwood frame • Elegant wooden feet. • Fully compliant with UK fire regulations. Crushed velvet wingback chair • Elegant scroll arms work well in classic or contemporary settings. • Crafted in luxury hard-wearing polyester fabric to create a wing back chair of exceptional beauty. • Foam filled backs with deep chesterfield buttons. • Comfortable foam seating. • This extremely luxurious contemporary chair combines style, quality and value at an affordable price. • Hardwood frame • Elegant wooden feet. • Fully compliant with UK fire regulations. Grey wingback chair • Elegant scroll arms work well in classic or contemporary settings. • Crafted in luxury French velvet style durable polyester fabric to create a wing back chair of exceptional beauty. • Foam filled backs with deep chesterfield buttons. • Comfortable foam seating. • This extremely luxurious contemporary chair combines style, quality and value at an affordable price. • Hardwood frame • Elegant wooden feet. • Fully compliant with UK fire regulations. Brown wingback chair leather • Elegant scroll arms work well in classic or contemporary settings. • Foam filled backs with deep chesterfield buttons. • Fully compliant with UK fire regulations. Blue Velvet Wingback / Armchair • Comfortable foam seating. • Hardwood frame • Elegant wooden feet. • Fully compliant with UK fire regulations. 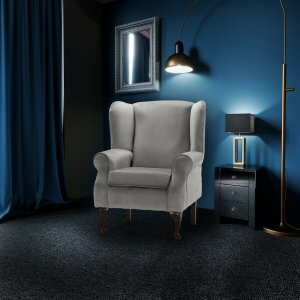 Grey Velvet Wingback / Armchair • Comfortable foam seating. • Hardwood frame • Elegant wooden feet. • Fully compliant with UK fire regulations. Green Velvet Wingback / Armchair • Comfortable foam seating. • Hardwood frame • Elegant wooden feet. • Fully compliant with UK fire regulations. Gold Velvet Wingback / Armchair • Comfortable foam seating. • Hardwood frame • Elegant wooden feet. • Fully compliant with UK fire regulations.